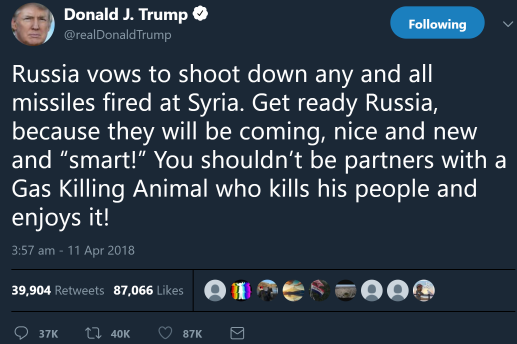 Just as Trump announced his intention to leave Syria and with the Syrian Government on the verge of taking the last bit of territory in the control of the Rebels...punctual comes another "chemical attack" to outrage the world and make Trump rethink about leaving Syria. After such "horror" he's now even thinking about military action against Assad, who has already been blamed by the World's media without any evidence. 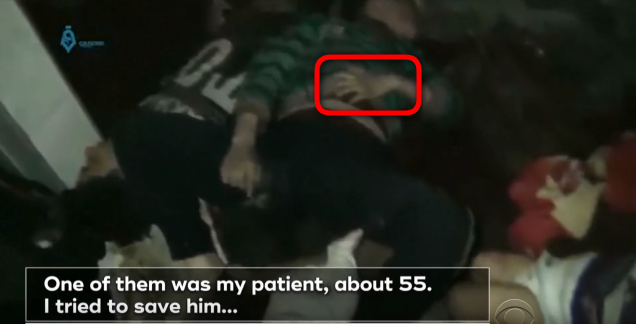 By the way the bearded guy I believe is the same person playing the doctor in this new "chemical attack" at 0:30-035 tormenting the kid into crying. After all wouldn't be the first time they recycle crisis actors. 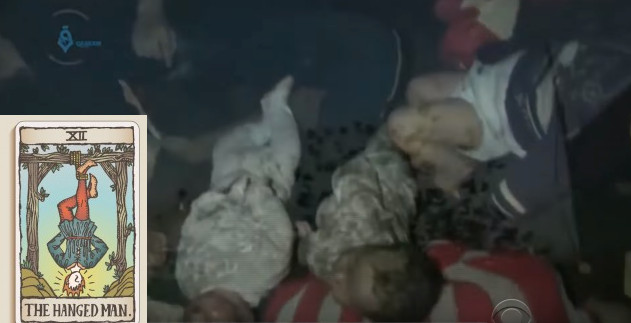 Although this video puts together the best performances, I don't see any real evidence of a chemical attack but a bunch of desperate "moderate rebels" using and abusing kids for propaganda to save their own skins and to get the West involved. It is still on the CBS site. I've saved it in case they take it down. But its' the mannequin kid with deformed rubber hand and harm (wire broken from too much bending) which was mostly pointed out in the comments. The other fakery that commenters pointed out was the baby dolls. Btw 1 with the position of the Hangman Tarot Card, which is something they love to do in hoaxes. Of course is not easy to put a doll in a perfect hangman position, but gives the idea. Obviously she's upset. Bless her. She's been thrown around and scared and sprayed with cold water. The worrying thing about these falseflag/hoaxes is that they often lead to an even biggar war with an escalation of deaths and suffering. Just like the imaginary WMDs of Saddam, and the 9/11 staged events which led to a decade of wars. If Trump decides to use the "chemical attack"as pretext to attack Syria things could escalate to a new level and we might have a WW3 on the horizon with Russia and Iran. Frankly I believe it is somehow all planned. 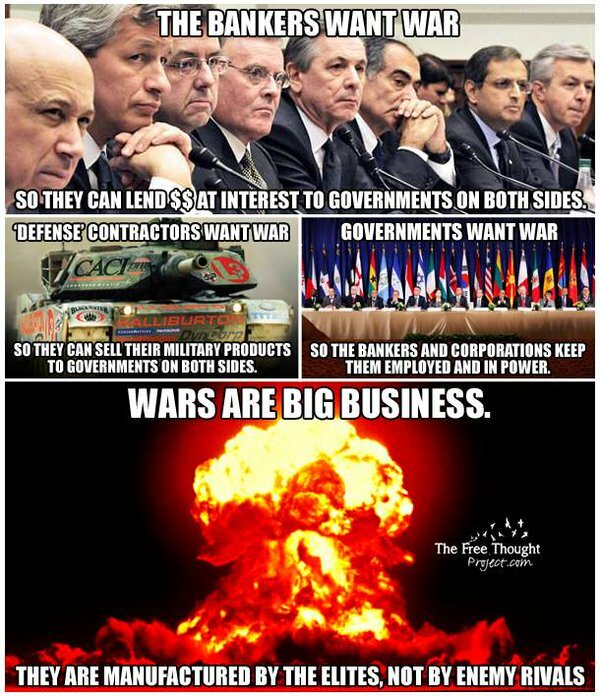 The Military Industrial Complex and The Banks want the wars to carry on. And it's a transversal interest group. Even Assad and his wife Emma (aka Asma Al Assad) I believe are agents in the Game. Same goes for Putin. For wars you need at least 2 warring factions. I even find it hard to believe Asma Al Assad is syrian. She doesn't look arab, nor persian nor assyrian. I bet my bottom crypto she's related to the European Royal Families, in particular the Royals of England and Spain. And we know she's a former Banker at Deutsche Bank and Jp Morgan. She's a goddess...but just like their goddess ISIS (the Egyptian Goddess which the Elites worship) they like to have a destructive side. All about duality, like that jumper she wears and the handsign she makes. If Syrians want to believe she's their protector....good luck to them. They'll need it. So far she's been pretty quiet while her former banking friends have moved in to destroy the country. 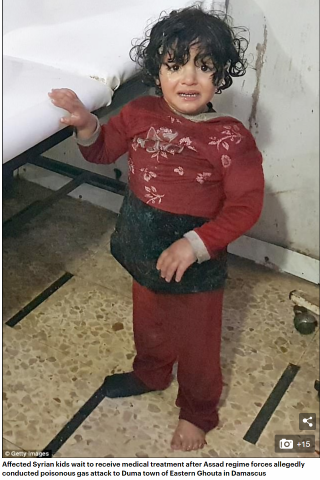 And her name Asma in spanish and in many other language translates to Asthma, the respiratory impediment which have been the leitmotifs of these chemical attacks. I wonder whether there was a bit of predictive programming in her name choice, though as a muslim name it means Beautiful and beautiful she is indeed. 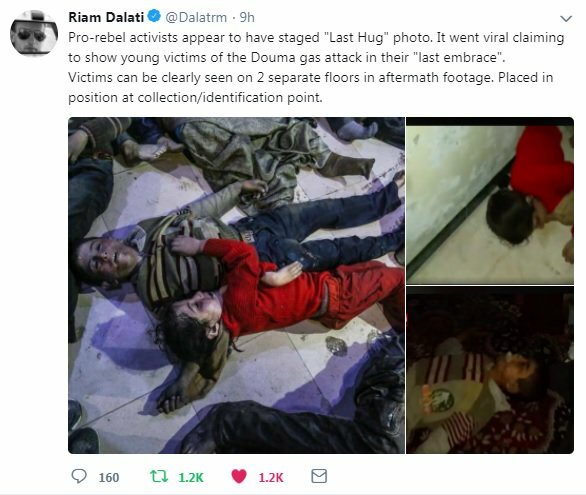 the final nail on the coffin: the russians found the boy in the video in perfect health and saying he and his mother were told to go to the hospital...and then once there they was grabbed and doused with water by a group saying there was a "chemical attack" . and this american journo in the days after the attack spoke with the doctors and staff there who confirmed that the scenes in the hospital were carried out by a group with cameras who caused chaos and confusion then left. They also said there were no deaths on that day, so all that pile of bodies was staged too. All evidence shows this event was an Hoax. Tucker Carlson did an excellent job -- very rare on MSM. Forgetting every thing else, if one just concentrates on motive, it's so obvious. true, here's the Tucker Carlson video for those who haven't seen it yet. Btw Tucker is one of the very few journalist followed by Trump on Twitter, so hopefully he'll listen to him. Anyway, let's hope for the best. Great video, on the tube! Fox is the only one that lets any opposing logical/thruthful opinions out. That only happens on occasion. Tucker Carlson: "What US national security interest is served by invading #Syria ?" Senator Wicker: "Well, if you care about Israel.."
So yeah for the US it is also another war for Israel. After all with all the money both Republicans and Democrats receive from zionist lobbies it couldn't be otherwise. Geopolitics is a bit like wrestling. The Puppeteers write the script and decide who fights who. 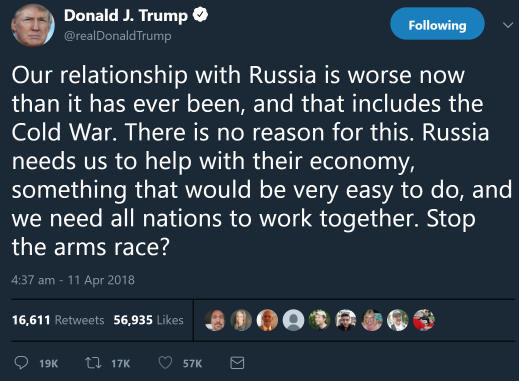 It's obvious Trump doesn't want to have a bad relationship with Russia, let alone war. These tweets by Trump make it obvious. What will happen this time? To appease the Deep State he will throw a few ultra expensive bombs (those "smart" bombs cost a fortune) and hit a few agreed upon targets (the ones that please Israel: likely Hezbollah bases). Both sides will pretend it was a huge attack....just when like 2 wrestlers hit each other...and this artificially created grudge match between USA and Russia will carry on as long as it is profitable for some. Great analysis like usual! I believe Trump is just talking WWF stuff to keep his adversaries off balance. Even if he does drop some bombs, it will be part of the show and lead to nothing. I predict he'll be pulling out the troops as planned. Wouldn't even surprise me if Putin and Trump had this twitter exchange rehearsed beforehand. 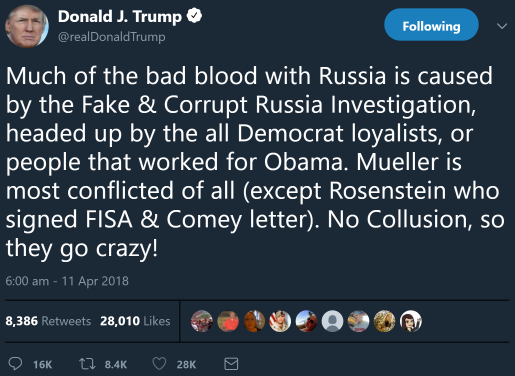 He's a showman, but I believe he's not in bed with the so called "deep state" and is fully aware this was just another false flag. The "Last hug" picture that went viral was staged as even BBC journo acknowledged. Russian officers visited the site of the supposed chemical attack and found no trace of any chemical use. Russia also blames the UK for staging the "provocation" having interviewed some of the people there. "During the provision of first aid, unknown people ran into the hospital, some of them with video cameras, who started screaming, panicking and pouring everyone with water from hoses, shouting that everyone was poisoned with toxic agents. Patients… and their relatives in panic began to pour water on each other,"